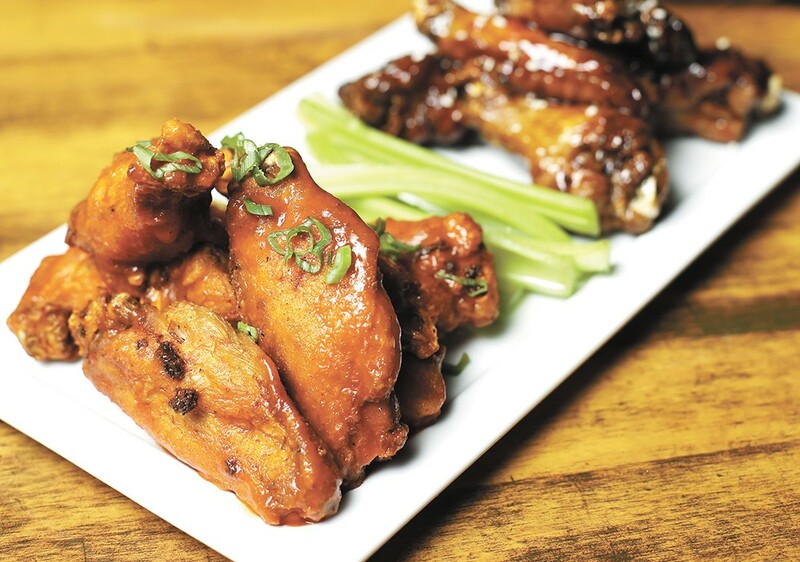 Wings can be coated in a range of tasty sauces at the Viking pub, which offers special pricing on Mondays. Go to a bar or pub anywhere in America and chicken wings drenched in some form of barbecue, buffalo or heat-heavy sauce are ubiquitous. In honor of the upcoming Super Bowl 52 — an unofficial wing holiday — and the heart of college basketball season, we sent seven Inlander writers to some of the region's most popular wing spots to nibble, gnaw and lick our fingers clean before sharing what we think. There are two kinds of people in this world: Those who eat chicken wings for the chicken, and those who eat them for the sauce. If you're the former, get out of here! It's all about the sauce. And the Viking rules when it comes to sauces. I tried both the traditional buffalo and barbecue sauces. Both were delicious. The wings are draped in sauce and sit in a puddle of it just in case you didn't get enough. I like just enough spice on my wings, and both had a little bite to them. If you want more spiciness, there's also fire buffalo and sriracha barbecue. Oh, and here are some other all house-made flavors at the Viking: island sauce, gold sauce, garlic pepper sauce, Cajun rub, ranch rub and garlic lemon pepper rub. As someone willing dive into a pile of wings from virtually any establishment willing to put them on the menu, I clearly don't have the most exacting standards. Even so, knowing that a place specializes in offering a world of delicious meats as basically its entire business plan, my expectations were definitely higher dropping by Outlaw BBQ than they would be stopping at some random corner pub. The wing gods were smiling on me as I walked into the Ref in Spokane Valley. It happened to be Wing Wednesday ($.75 wings), and happy hour to boot (2-6 pm). A dozen wings and a cold PBR. That's all I needed to walk away fat and happy. I ordered six with the chipotle raspberry and six with the peanut butter and strawberry jam (just because I'd never tried it). Both were good, but I wish I had ordered all 12 with the former. These wings were so damn good I was crunching on the cartilage for more. Spicy, but with a nice raspberry sweetness to neutralize the kick. I also sampled the huckleberry barbecue, which favors the sweet over the smoky, but is still just as tasty. 24 Taps is a sports bar, the sort with dozens of big-screen TVs lining the walls broadcasting either basketball or music videos. Wings may not be the raison d'être of 24 Taps, but they are a necessary staple of the sports bar genre. And while the selection of teriyaki, buffalo or barbecue wings isn't anything particularly radical, 24 Taps acquits itself well. I need to start this with a blasphemous confession: I don't really like wings. It's largely because they're a chore to eat and incredibly messy. Tearing tiny pieces of meat off of bone and cartilage with my teeth is not my favorite way to eat. Nonetheless, for the sake of consumer food science, I found myself nibbling away at some wings my guy and I ordered at this longtime North Spokane sports bar. He enjoys both wings and super spicy sauces. We met in the middle, ordering the Screaming Yak's Korean sauce, listed at three stars and described as a "sweet chili blend with a big kick," and also the most popular sauce amongst customers. It was as predicted, slightly spicy with a hint of sweet. When Food Network's Diners, Drive-ins and Dives visited Capone's for the "Wings n' Things" episode in 2010, they weren't after the wings; it was pizza the garrulous Guy Fieri wanted. This time around — the latest episode featuring the Coeur d'Alene-based restaurant aired this past October — Fieri was all about the wings. 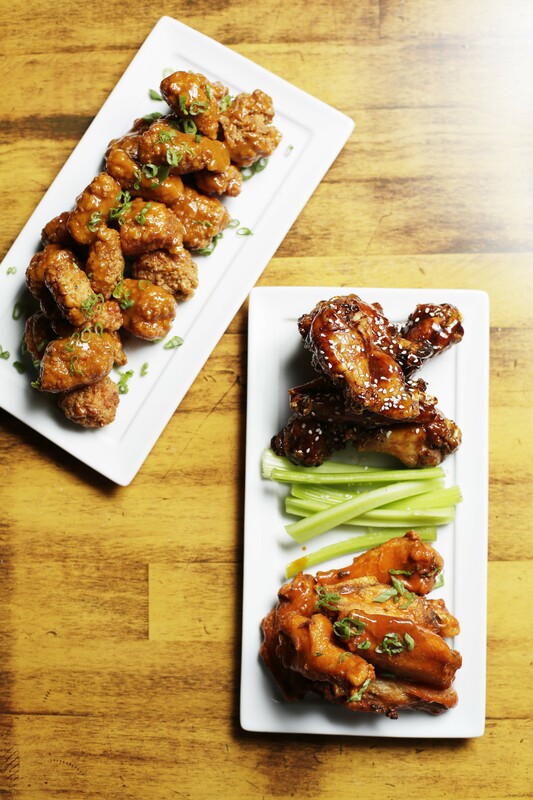 Not content to offer just traditional bone-in wings, Capone's also offers boneless. My partner in this wing-speriment preferred traditional, with its perfectly cooked chicken skin and dark meat, but the boneless tenders get chops for crunchiness with a breading-like coating that really soaks up the sauce. The original print version of this article was headlined "Thing for Wings"